The Real Mary King’s Close is delighted to be playing host to renowned Scottish contemporary musicians Iain Morrison and Daibhidh Martin to mark the occasion of the launch their new album. Playing a live acoustic set on Thursday March 10th, it is fitting that Iain and Daibhidh have chosen this unique, historic location to play their only Edinburgh ‘Haunted Bird’ date. Iain Morrison and Daibhidh Martin were born and brought up on the Isle of Lewis in the Outer Hebrides, and have written songs together for the last decade in a diverse range of critically vaunted projects considered by many to be at the forefront of Scotland’s burgeoning new trad and alt-folk music scene. Haunted Bird is their debut joint collaboration and expands from the alt-folk tag. Its soundscape remains rich in roots, warm and glowing, but the songs are more sparsely crafted and open, cast around unforgettable, natural melodies. Iain Morrison is one of Scotland’s most inventive and acclaimed contemporary musicians; a piper from the Gaelic tradition; a guitarist and composer with a golden ear for strong melody, and an engaging, expressive singing voice. Iain is also the winner of Composer of the Year in the Scots Trad Music Awards 2010. Daibhidh Martin writes poems and stories in short forms: a flow of iconic sometimes surreal fables, myths, micro-fiction and fragments of balanced and crafted words that chart the brief moments of intense life. Daibhidh has been a major part of many of Iain’s critically acclaimed projects during which, the partnership that has now produced ‘Haunted Bird’, has come into sharp and vital focus. Tickets are strictly limited due to the unusual nature of the Close as a venue. 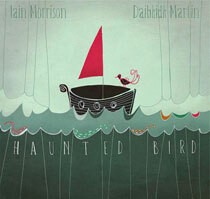 For more information about the gig or Iain and Daibhidh visit the Haunted Bird website. Next PostNext 17th century ‘hand-fasting’ to celebrate Royal wedding at The Real Mary Kings Close!